Dollar Academy teacher Jilly McCord has sealed her place in the final of one of TV’s most popular competitions. 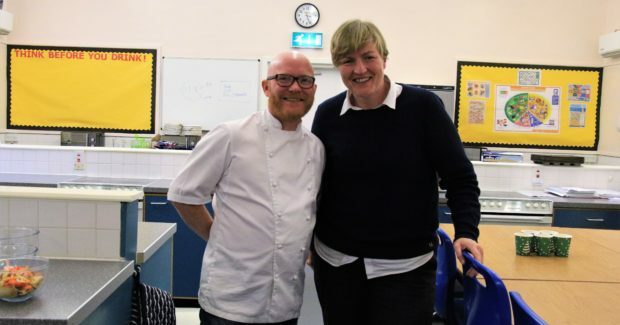 The history teacher, who recently moved from Inverkeithing to Cramond with partner Kimberley Fergus, is one of just five people left in this year’s BBC’s Masterchef. She 41-year-old former rugby internationalist wowed judges with her dish of venison loin with pickled blackberries and celeriac mash, served with winter veg, with food critic Amol Rajan declaring it the best venison dish he had ever eaten. Presenter Gregg Wallace described her as the bravest cook in the room. Earlier, Jilly had described the adrenaline of the contest as being similar to that experienced when preparing for a rugby match. Jilly was one of eight contestants to make it through to this week’s semi-final and said pupils at her Clackmannanshire school had been rooting for her. Boarding children had been gathering in the evening to watch her in the Masterchef kitchen, while day pupils viewed the programme at home with their families. “Cooking has always been my hobby. When I was young I used to stand next to my dad when he was cooking, asking him what he was doing, and you pick it up,” said Jilly, who was first to be picked as a finalist by judges Wallace and John Torode. “The bravest cook in the room today for me was Jilly,” said Wallace. Jilly and her fellow finalists will next be on screen on Tuesday when they head to the Royal Society in London to cook a five-course tasting menu to celebrate the 40th anniversary of the Transglobe expedition, hosted by Sir Ranulph Fiennes. The following night, the final four will embark on a culinary adventure in Hong Kong.